Sampei was fishing in the spot where the river’s mouth opened into a wide yawn and poured its waters into the wide basin of the lake. There little eddies cast their spell on his eyes hypnotizing him in a relaxed state of deep alertness. He was patient. His long hands could hold the fishing rod unflinchingly. He sat there, on the last stretch of the river’s bank and waited. The waters rushed ahead, never stopping, their voice was loud and steady. Behind the mountain was slumbering, its deep fire within was just bubbling imperceptibly. On the top the last snow lingered on, while the sky was rosy with dawn. How could he catch enough fish to sell to the village market was all that mattered to Sampei. His life was uncomplicated by those longings and tempting desires that nowadays vex so many young men. His old grandfather waited for him at home, and used to prepare for him a rice cake every day. Sampei loved the cozy atmosphere of their simple meals, and the taste of sake at the end, when he would tell his grandfather about the fishing and the hues of the dawn in the sky. As he sat there with an empty mind, waiting for his next catch, something big pulled at the fishing line. This time it was a golden carp. When he unhooked it, Sampei hesitated: something glittered in the fish’ mouth. It was not a fairy ring, but a little golden box. He opened it and to his great amazement he found a little note inside. 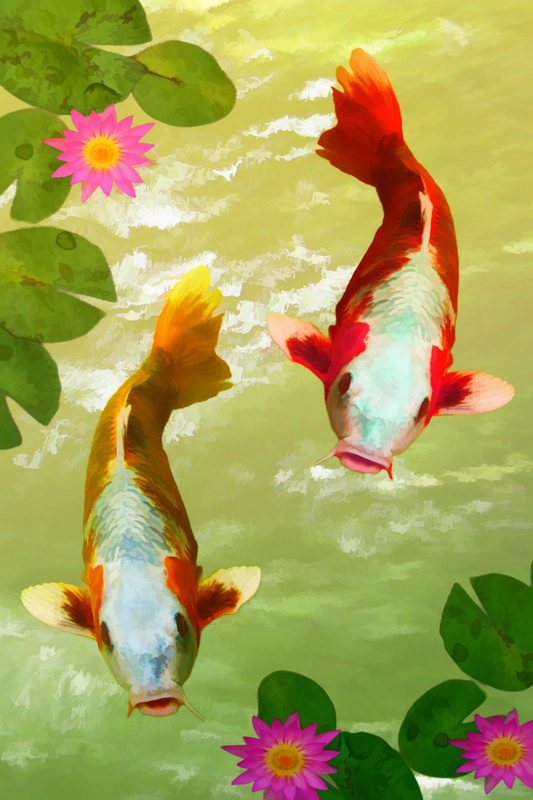 But Sampei could not read, yet he felt very lucky because a golden carp was a rare catch and a good omen too. Besides, he kept the golden box with the note by himself and hastened on his way back to the village. That morning he made a good bargain at the market and went back home with his pockets full of coins. His grandfather welcomed him back and listened to his tale about the wondrous size of the golden carp. Yet, for the first time, Sampei hid something from his grandfather: he did not mention the golden box with the note. Not only because his grandfather could not read either, but also because he felt it was a singular event, something which was between the golden carp and himself. The day after Sampei set up a small altar on the river bank and thanked the spirit of the golden carp with incense offerings and herbs. The mountain seemed still asleep and looked mysterious with its white cap enveloped in the orange and pink of dawn. But to Sampei these words were like a blow, as he had sold his golden carp the day before, to a servant girl who worked in the house of Oki the geisha. He ran away from the elderly scribe’s stand, who gazed long after him in astonishment. Suddenly he remembered what the servant girl had said: her lady loved goldfish and kept them as pets, for sure she would be happy to have such a big golden carp in her garden pond. Maybe he was still in time: he would buy the golden carp back from Oki the geisha. ‘So you want your golden carp back.’ She said pensively, when he showed her the golden box and the note, because he was sincere, but a tiny bit naïve. Sampei was flustered. He had thought that the message was for himself only, but actually nowhere it mentioned his name. ‘And what would you make of it, anyway? You would probably eat it with your grandfather’, she said. Seeing he looked so sad, she suggested he should come along every day to visit the golden carp. Sampei was very bashful and grateful to the beautiful Oki, who, I reckon, had taken a fancy to the innocent young man. It was not long before Sampei became very good at reading and even while fishing he would often read a book that the beautiful Oki had given him. In time, he went back to the village empty-handed, as he had grown so engrossed in his new pursuit that he had given up fishing altogether. Moreover, he did not want to disappoint Oki the geisha. His old grandfather started to fret and worry, as they ran out of provisions, and those were hard times for villagers. One day, a gossipy neighbor told him: ‘I know why your grandson does no longer bring fish to the market. He is too busy visiting Oki the geisha’. The poor elderly man was very sad and concerned, as now he could make sense of Sampei’s late strange behavior: the stirrings of first love for a woman who could lead him to ruin. But since he was a wise man, he decided not to speak to Sampei about it. Instead he went to Oki’s. The lady welcomed him with a sumptuous tea ceremony in her garden, where a huge peacock was strutting around in all its glory. Oki was an understanding woman, and told the old man about how they first met and the story of the golden carp and the note in the golden box, and of their bargain and how she taught Sampei to read. She reassured him that for his sake she would no longer entertain his grandson and the elderly man left reassured. When Sampei knocked at her door, she bade her servant girl not to open and pretend she was busy or traveling. In a short time, Sampei grew gloomy and jealous, and lost his youthful innocence. He now spent his morning in bed, no longer pretended to go fishing, and very soon his grandfather was obliged to sell his geese in order to make some money. But Sampei just grumbled and turned to the other side. No longer did he bask in the sun, no longer did his gaze follow the bluebird at dawn. Soon came the spring and his old grandfather died of sorrow. The earth was green again, but Sampei’s heart was cold like a stone. Oki’s door remained shut ever after and Sampei left the village never to come back again. I have heard he became a restless wanderer, that he lived in forests and dens, but nobody ever knew for sure what happened to him.